Do you own any old, broken or worn out jewellery? 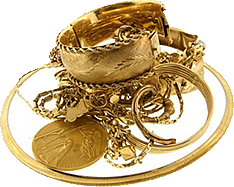 Perhaps you have items ready to be traded as scrap gold for recycling. At Brisbane Gold Buyers, we base our value on the total content of gold in your items, regardless of their condition. And the good thing is, we even come to you, which means you can earn cash right on the spot! For the chance to sell your old, broken or worn out gold items for instant cash, contact us now to arrange an appointment.